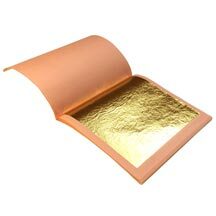 Kolner Miniatum is a unique gilding size that is ideal for gilding gold leaf on paper, degreased vellum, leather, illuminated manuscripts and other flexible surfaces like foil or plastic. It is available in yellow and clear. Miniatum is known for it’s elasticity and long-lasting gilded surface. When turning illuminated pages the Miniatum size stays flexible and will not cause the leaf to delaminate. Miniatum size gives you a very bright gilding surface that is almost equal to burnishing with a stone burnisher. Acid free, heavy weight paper is preferred and the smoother the surface of the paper, the better the glass-like finish. Miniatum size gives you a very bright gilding surface that is almost equal to burnishing with an agate burnisher. You can apply the Miniatum size with a brush or a drawing pen. When the size has set, you can apply the gold leaf. Transfer leaf works best. Volume: 50ml.